Rural Spark on international entrepreneurship event. Rotterdam, September 2018 - Rural Spark was present during the 2018 Netherlands India Business Meet, organised by NICCT and hosted by the Mayer of Rotterdam, Ahmed Aboutaleb. Harmen was keynote speaker on the event that focussed on innovating infrastructure. For electrification, infrastructure is a big factor to work on. The rural Indian market can be described as a typical commodity market. In the rural markets, solar lanterns and solar home systems are being sold without a smart service model or a bigger vision towards the future. However, to really provide a future proof, scalable solution, the market will have to transform into a micro-utility market. 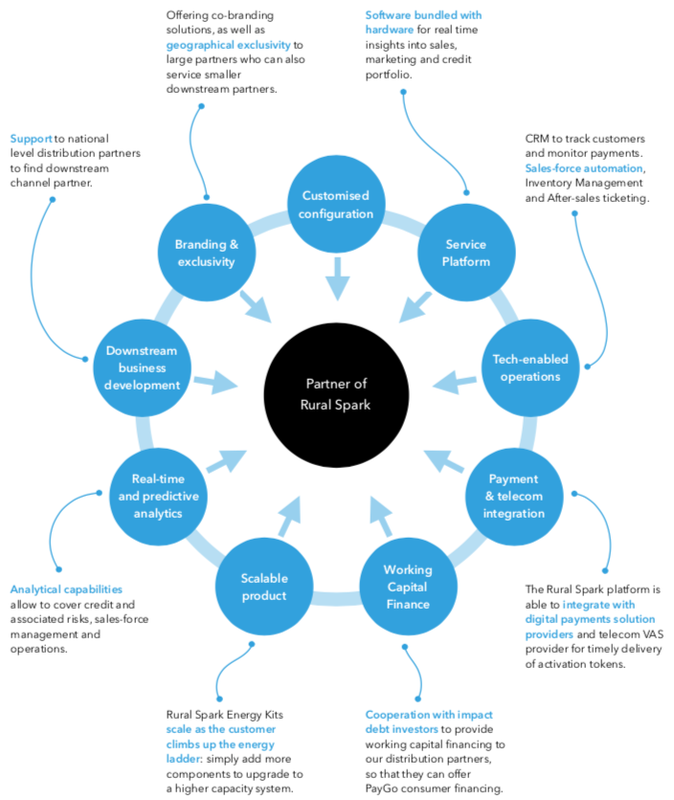 Rural Spark sets out to modify the sector from a commodity industry to a utility industry. This model requires new infrastructure and distribution models, together with all partners involved. Rural Spark: a solution that fits the context. Rural Spark offers an ecosystem that does provide support to our partners, and strengthens the infrastructure for real electrification to happen. There is still a lot of work to do and Rural Spark is looking forward to work with even more partners to change the sector. This demands new approaches towards the villages, including after sales, service and customer relationships. As Rural Spark, we have tools in place to facilitate this, as the Rural Spark Service Platform supports the complete value chain. This online tool tracks & triggers payments, activates systems, provides service, offers marketing opportunities and makes the money flow transparent for distribution partners. It also allows for direct contact with the villagers for support, tips, promotions and increasing user engagement. Sales force automation, Credit Score Cards, Inventory Management and After Sales ticketing strengthen the infrastructure. Currently reliable, future proof solutions that hold potential, have difficulties reaching the market because they can’t flurish using ’singe-sale-models’. Innovating Infrastructure it is! Let’s Electrify. Let’s make it happen. Rural Spark is proud to announce that we have found Bart Driessen to be our Executive Director. Bart is a experienced entrepreneur with more than twenty years of experience. He founded a creative communication agency and made that company grow to an award-winning major player. The company provided many national and international corporates, startups, governments and ngos with services as corporate identity, communication/marketing strategy, creative design and digital services. Bart is a generalist, combining a clear vision, strategic overview and entrepreneurship with hands-on mentality. He is a leader, aimed to build and motivate teams. He has a creative mind that always comes up with new solutions and new opportunities. His leadership capabilities will inspire the whole team to speed up growth, making Rural Spark even more sustainable, financially viable and innovative. One of his major focus points will be the marketing strategy of Rural Spark. The new Bid Book for the Energy Transition in the Startup Delta, rightfully mentions the importance of CO2 reduction and sustainable solutions. Here the start-up solutions are highly needed. We are happy to strengthen the Rural Spark team with the skills of Pawan Singh. As efficient and organised accounting professional with broad experience in finance and accounting, we increase our financial professionalism. Before joining Rural Spark, Pawan worked with a travel company, but the creative work environment at Rural Spark convinced him to work in this startup environment to share his experience, skills and structure. We look forward to see Pawan in action. Pawan is brought up in Delhi, is married and has two children. His Cricket skills are also something the team is looking forward to experience in real life. Having won the Zonal Cricket, as a middle order batsman. we feel we can learn a lot here! Pawan, welcome to the team!